"Hidden Histories of a Million Wartime Women"
Members of the Royal Engineers help with the washing-up after tea, served at a mobile canteen by a WVS volunteer, London, 1941. The mobile canteen vehicles had the names of their donors painted on the sides. Having a longtime interest in stories of the Blitz, and in women's history, I was especially intrigued to learn of a Kickstarter project collecting funds to digitize, and make available free on the internet, the first of the series of wartime accounts kept on behalf of the Women's Voluntary Service, as the members worked running clothing, scrap, and paper drives, driving ambulances and mobile canteens, providing services during and after air-raids, organizing evacuations of children to foster families in the countryside, and surely a thousand other things at least. Each local WVS center submitted a monthly report outlining its activities and services, giving us, in some 28,000 now-fragile documents, a fascinating and invaluable look at life on the home front in 1940s Britain. Kitchen scraps are collected by this WVS volunteer, East Barnet, Hertfordshire, 1943. Another volunteer helped load them up, and drove them to a local pig farmer for use as food for his animals. "May 1941 ... 3 Cases of clothes for bombed out people have been forwarded by the Mayor to W.V.S. They had been sent by Red Cross workers in Bolivia ...."
WVS ladies in Welshpool with donations of scrap metal, July 1940. "May 1941 ... W.V.S. is undertaking to make a particular type of bed jacket to be worn by spinal cases under plaster-of-paris. They are also making special pyjama coats for cases of burns ...."
Ambulance drivers and members of a stretcher party have a tea break from a WVS mobile canteen, 1941. "July 1944 ... During May W.V.S. Old Town Dining Centre served 5,402 main meals, 688 tea meals and 5,035 cups of tea ...."
A WVS volunteer cuts strips of cloth to use in making camouflage netting, London, 1943. "November 1943 ... The amount of knitting done for the Merchant Navy has increased. We have sent off two parcels; containing a total of 54 garments (Sweaters, scarves & socks) ...."
Two WVS volunteers sorting clothing sent by American donors, London, 1941. "December 1940 ... One of our elderly canteen volunteers, who had the previous week been in the office to see if she could do night work for us -- was in the Town Hall W.V.S. Office the morning after the Sunday night raid, fitting herself out with necessary clothes. We asked her if we could do anything for her, and she replied that if we could send two wires to her soldier sons she would be grateful. Our Secretary took the addresses and the message down -- and the wires both said 'Bombed out -- but still smiling -- Mother.' She had no home, no clothes, no money -- and tears came to her eyes, but her desire to avoid worrying her sons as shown in her telegram was, we considered, almost heroic...."
You can see two videos about the project, including one about the archival digitization process, and a representative sample of the reports, on its Kickstarter web-page. All of the photos are from Wikipedia. Well, it took me an incredibly long time, but I have at last finished a scarf for the Red Scarf Project. (There is a Red Scarf Project 2007 blog, too, although I believe that the Project itself is on-going.) This is the organization that sponsors "care" packages for kids leaving foster care and heading off for college, the packages arriving around Valentine's Day and including a handmade red scarf in each. It's a bit embarrassing to call this a pattern, it's so simple. I'm not a big fan of either acrylics or heavily-textured yarns, but I like this -- the bouclé is even nicer on the bias, I think. And machine-washable! The yarn is very splitty, but frankly I just ignored that most of the time, and it was fine -- a little extra texture here and there, eh? The pattern requires almost no concentration at all, although I did find it much easier to remember where I was by putting a large safety pin at the upper edge on the front, moving it up as the scarf grew! You will need 1 ball of Bernat Soft Bouclé in "Richest Red" and a pair of US7 or 8 needles. This pattern will make a scarf about 7 x 59 inches (18 x 150 cm), is machine-washable, and is designed to use the entire ball of Soft Bouclé, with a bit left over as a margin of error. If you want to make it go as far as you possibly can, I highly recommend putting in a lifeline before beginning the last decrease section, as the bouclé is very tricky to pick up once ripped out! Kfb = K into front of st, then into back of the same st.
Row 3: Kfb, K to last st, Kfb. Rep rows 3 and 4 until there are 34 sts. Next row: Kfb, K to last 2 sts, K2tog. Rep these 2 rows until scarf measures about 59 inches. Next row: K2tog, K to last 2 sts, K2tog. Rep these 2 rows until 2 sts rem. K2tog, and draw end of yarn through the last st to fasten off. Weave in ends. Please feel free to write with further suggestions! 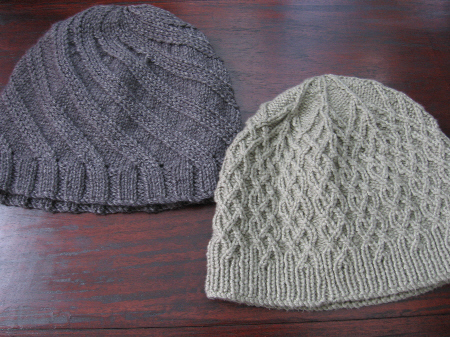 Here are two chemo hats for my friend. 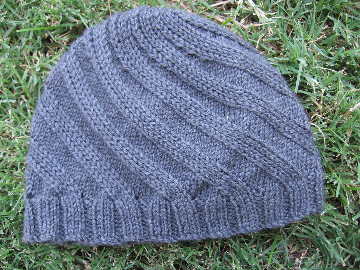 Odessa is a fast knit, simple and elegant, easily memorized (even the crown shaping), and it uses only one ball of Cashsoft with quite a bit left over, so you don't have to skimp. I left off the beads, obviously, not sure how that would feel as a chemo hat. The hint of cashmere makes it wonderfully soft. And it looked so cute on Laura that I suspect I'll be making more soon! 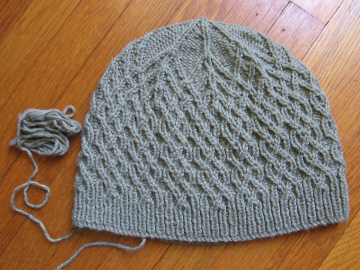 The pattern itself is complicated, with a lot of fiddly cable work, although the chart may be a little more off-putting than it needs to be -- the reason for the numerous cable symbols being that in some places you cable over two knit stitches, and on others you work this maneuver over a knit and a purl, which is called a twist (not technically a cable, apparently), and these require different symbols. After the first repeat, though, it all starts to make sense. A bonus is that inside is a lovely smooth field of mostly knit stitches, very nice for sensitive heads, and a very thoughtful touch on the designer's part. I am actually happier with the shorter version. I've heard that longer caps are better for chemo patients, to keep the head covered and I suspect to disguise the lack of hair, but I think that the cap is more flattering with it not quite so low on the forehead. (It's more trendy in the original length, to be sure, but for myself I prefer flattering over trendy any day, and I think that my friend does too!) At this shorter length, it can still be worn back on the head so that it reaches the nape of the neck, but it frames the face a bit better. I have a dear friend who will be starting chemotherapy for breast cancer in a couple of weeks, and so naturally my thoughts quickly turned to knitted comforts. 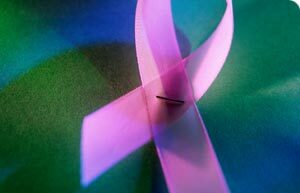 Fortunately, in a way, my experience with chemo is limited to one person in my family -- also breast cancer, like my friend -- but since it was high summer in Southern California during her worst weeks, she felt most comfortable without anything atal on her head, and so doesn't have much advice about patterns or yarns. If anyone has suggestions, I would be most grateful! I've been admiring Grumperina's lovely Odessa for some time, in and of itself, and so that was the first thing that came to my mind. 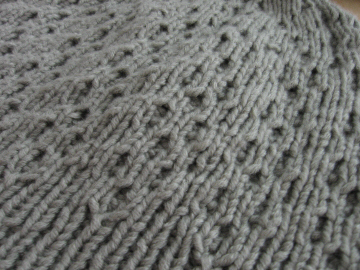 Grumperina used RYC Cashsoft DK, and I even happen to have some on hand, in a beautiful thundery grey, very "Scottish autumn," as per the request. But I've read in a couple of places that wool is not recommended for chemo caps, and so I hesitate -- Cashsoft being a merino/microfiber/cashmere blend. There is also Shedir in Knitty's Breast Cancer Awareness issue from a few years back, and I think that Rowan's Calmer would be a wonderful cloud-soft choice. My friend thinks that perhaps something close-fitting, as these both are, would be uncomfortable, but I wonder if something loose wouldn't stay on very well, once the hair isn't there to help hold it on. There is definitely a consensus on the internet about seamlessness -- understandable in the circumstances. But what about the wool? and washability? Does the luxuriousness of Calmer and Cashsoft outweigh the dreariness of handwashing things when one is not up to it? There are, by the way, lots of free knit and crochet patterns for chemo caps at Head Huggers (which also accepts donated caps for distributing to patients of all ages), and links to patterns here from Dallas/Fort Worth Fiber Fest -- I've also found a fancier hat at KnitPicks (which might work in Calmer...) and a rather fetching toque here, too. I had a suspicion that I would probably not get around to knitting in the current Project Spectrum colors each month, with so many other things in the knitting queue (let alone life, etc. 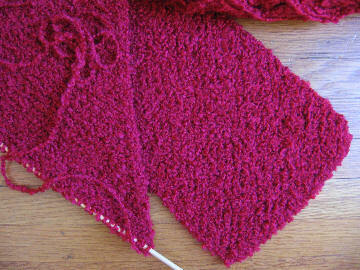 ), but here is a red scarf on the needles. It's a perfect car-knitting project, eminently rollable, for those I'm-five-minutes-early-to-pick-up-the-girls-at-school days. I heard about the Red Scarf Project too late this past year to send something in, so I wrote and found out that it will be an annual project. The Orphan Foundation of America makes "care packages" for foster children who are going off to college, and the packages around Valentine's Day contain among other things a red knitted scarf. As the OFA website points out, "[The college-bound kids] are success stories merely by showing up: Studies show that less than 50 percent of foster youth graduate from high school, and less than 10 percent go on to post-secondary or vocational training," and most of them don't have families to support them. 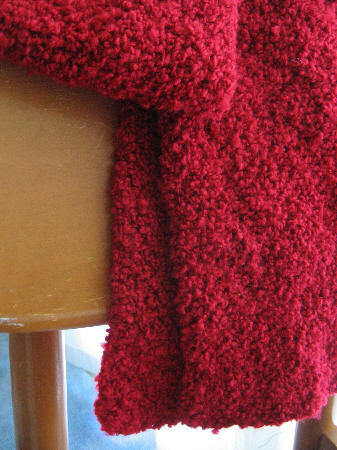 This particular scarf is in Bernat Soft Boucle in a rather vivid scarlet. I'm working it on the bias -- I like the way that the fabric feels this way, a little bit more intriguing than straight rows, especially with the bouclé disguising the angles. 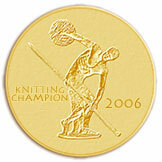 I'm starting a new category, "Good Things," for charity knitting. It's always been important to me to help others, although I admit that I have not been as consistent about it as I should be. But helping Laura recently with service projects for her Brownie troop has made me feel that I should dedicate more of my time to this, and set a better example for my daughters in the process. This category, then, will be a collection of opportunities for knitters such as myself to help others, through multi-, inter-, and non-denominational service organizations. 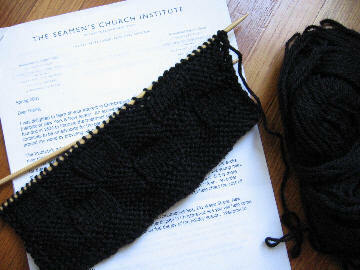 I didn't find out about the Orphan Foundation of America's Red Scarf Project until too late to make this year's deadline, and then only a few days later, I came across in my pattern stash the reply to my query about the Christmas-at-Sea program run by the Seamen's Church Institute. I'm happy to borrow the name for this category so that perhaps it may come to mean not only clever solutions to everyday living but also good things in the greater sense.